Colin, circa 1992 - raising that foot to the highest it's ever been. If the front kick were 'leg only,' you'll only be able to hit as hard as the proportionate power from the muscles in your leg. A teacher told me once that the side kick is the most difficult, non-gimmicky kick to do correctly. It is also the most powerful. It can be one of the benchmarks to measure all other basic kicks in terms of striking power. 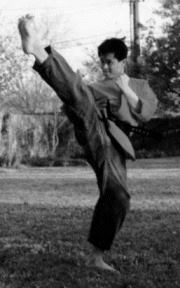 Most beginners focus only on the lower aspect of the leg whilst kicking. Similarly most beginners focus on the end bit of the weapon when trying to generate power. 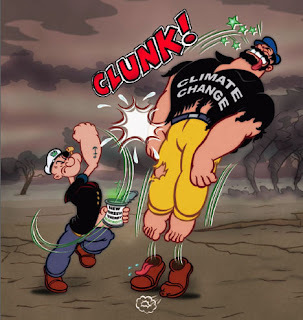 For instance, if punching, they'll focus on the fist. If kicking they'll focus on the leg extending. In my school, I try to emphasize the power from most basic techniques coming from the ground up. Stable base. Dynamic leg action. Knee drop. Hip twist. Breathing out. Abdominal tension. Shoulder rotation. Tightening of muscle structure to focus the strike. And then landing the weapon. See? The weapon is the last to impact. Beginners only think of the last few elements whilst trying to increase power. For the front kick I was talking about, we want to send body mass through the leg. The leg muscles shouldn't have to work any harder to increase striking power exponentially. The support leg has got to be supple and dynamic. A stiff support leg is only good to hold you in a standing position. Bending the knee allows much more maneuverability and allows the support leg to push down and backwards on the floor. The body in a state of forward motion cannot have it's mass transmitted easily if the hips are freely rotating either clockwise or otherwise. I try to tell beginners to align their hips so that the kicking leg is directly in front of the support leg. If you kick like you're doing some red army march, you'll see the kicking leg quite unaligned to the support leg. On point of impact there's going to be some triangulation occurring. Reducing this triangle allows you to transmit body mass through the hip and into the kicking leg. If the kicking leg is kicking forward, what does the support leg do? The support leg has to drive into the ground and push back as hard as you're intending on going forward. Part of this is to shift body weight towards the opponent so the support leg doesn't have to do so much work. But you can't think that the kicking leg is doing all the work. You're learning a system aren't you? Well, this is the system. Everything is connected! On point of impact you'll need to follow through and maintain optimal muscle tension. Are you kicking the shield or the person holding it? Stopping the leg on the wrong surface doesn't allow you to feel how to apply your power correctly. Good article. The bodies center of gravity is just behind and below the navel (hara in Japanese, Dan Tien in Chinese). By using the hips as described above, you move your center of gravity, effectively putting your entire body weight behind the kick.